Across its seven subject areas, London Business School employs faculty members from over 30 countries. In addition to teaching courses, these scholars and practitioners help run the School’s seven research centers and initiatives, which investigate topics such as private equity, entrepreneurship, energy markets and asset management. London Business School notes that while the majority of course material is delivered via lectures and case discussions, instructors also make use of other techniques such as field visits, guest speakers, and role-playing scenarios. Upon arriving at LBS, first-year students are divided into groups of approximately 75 students each that take their core courses together. These groups are further broken down into study groups of six or seven students each. Throughout the first year of their MBA studies, students work on assignments with their study group members; the school reports that study groups earn about 30 percent of their first-year grade together. The pre-term period for first-year MBA students begins in late August and is primarily comprised of three courses that last through the end of September. The first of these, Global Leadership Assessment for Managers, is designed to help students work on their interpersonal and teamwork skills in a cross-cultural setting. The second, Leadership Launch, allows students to choose from a menu of courses that use practical exercises to help them develop in a variety of areas, from speed reading to managing stress. Finally, Understanding General Management teaches students about common challenges that business managers face and how to overcome them. Following pre-term, students spend three terms—Autumn, Spring and Summer—completing the required curriculum. Autumn Term runs from September to December, Spring Term from January to March, and Summer Term from April to July. Each term, first-year students complete four to five core courses focused on foundational business disciplines. Students who have extensive prior experience in corporate finance and accounting gained within the last 10 years may take an exam to waive out of core courses in these areas and replace them with elective courses. In the summer between the first and second years, most MBA students opt to complete a summer internship, though students may also participate in LBS’s Summer Consulting Programme or Entrepreneurship Summer School. Unlike most MBA programs, which last either one or two full years, LBS allows its students to graduate after 15, 18 or 21 months of instruction. The second year of the program follows the same three-term calendar as the first year. During the second year, students must complete a summary course called Capstone as well as the course Global Business Experiences, through which teams of students partake in projects at locations throughout the world alongside LBS faculty members. To graduate, students must complete a minimum of 10 and a maximum of 12 elective courses. LBS enables students to tailor their studies to their desired career paths by taking five or more electives in one of seven elective concentrations. Students can also enroll in courses at University College London to supplement elective offerings at LBS. In keeping with the school’s international outlook, MBA candidates must also demonstrate competency in a language other than English to graduate; qualifying languages are Arabic, Cantonese, French, German, Greek, Hebrew, Hindi, Italian, Japanese, Korean, Mandarin, Portuguese, Russian, Spanish and Turkish. 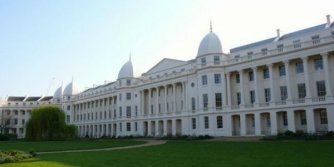 Students who plan to complete their MBA studies in 18 or 21 months may also spend a term studying abroad at one of LBS’s more than 30 partner schools. The school reports that 40% of MBA students spend a term abroad during their second year. In addition to its full-time MBA program, LBS offers several MBA degree options for applicants who are more advanced in their careers. One such option is the 20-month Executive MBA, which is held across London and Dubai. The school also supports two 20-month Global Executive MBA programs: the EMBA-Global Americas and Europe held between LBS and Columbia Business School, and the EMBA-Global Asia held between LBS, Columbia Business School and the University of Hong Kong. Minimal space occupation by folding and fitting,can store in your bag when travel or outdoor,let you never worry about the sudden rain shower. RT @niral_parekh: #R4NA raise a glass! London Business School is expanding - 2 new buildings!